Former Temple President Martin Vesole explores Judaism and reform in the 21st century. In the book, Rabbi Hertzel is being held for a murder he did not commit -- a charge that may have something to do with the fact that he found an ancient scroll in a cave outside of Nazareth describing Jesus as a mere human. Are the rich and powerful out to get him? Will God help save him? 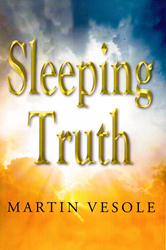 “Sleeping Truth” explores Judaism and reform in the 21st century in a story centering on the fictional scroll, called the Book of Emet, which relates the story of Jesus from the point of view of his best friend from childhood. A panel of experts is convened to discuss and compare the scroll with the New Testament. The panel includes a gay Unitarian minister, a divorced male rabbi, an unhappily married female televangelist and an elderly knighted British historian. The plot unfolds with a forbidden love story, a vast right-wing conspiracy, a shocking murder and a magical ending. The book outlines Judaism and reform in the 21st century and recommends adding New Age ideas to Jewish theology to bring it out of the Middle Ages and into the 21st century. For instance, the notions that God is not all-powerful and that reincarnation makes humans increasingly more helpful to God in making the universe a better place. Martin Vesole is a retired attorney and former president of Temple Menorah in Chicago. Founder of the Shalomist Movement to save Judaism in America, Vesole earned his degree at DePaul College of Law after studying history at Washington University in St. Louis. While enlisted in the U.S. Army, he served in Vietnam. Vesole went on to live in Israel, first taking classes in Judaic Studies at Hebrew University in Jerusalem and then working at Kibbutz Naot Mordechai in the Upper Galilee region of the country. For more information visit: http://www.martinvesole.com/.